European Commission's Joao Santos and Cedefop's Head of Department for VET Systems and Institutions Loukas Zahilas opened the meeting. 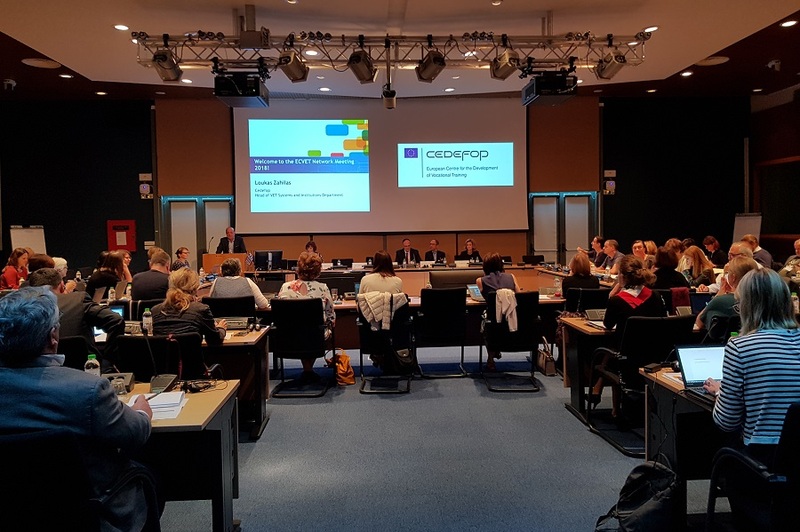 Cedefop expert Anastasia Pouliou presented the agency's research project on the changing nature and role of vocational education and training (VET) in Europe. This large-scale study, implemented between 2016 and 2018, aims at capturing VET’s dynamic character by analysing the past changes and giving ideas on future opportunities in Europe. The project’s main objective is to get a deeper understanding of the ‘VET system’, of differences across Europe (EU Member States, Norway and Iceland), and to improve the understanding of change and development in the area of VET. Its findings feed into the ongoing debate on European VET cooperation strategies post 2020. The study's starting point was the fact that vocationally oriented education and training is something more than the traditional VET delivered at upper secondary level (in the form of school-based education or training, apprenticeships, or combinations of these). External consultant from ICF/3S Monika Auzinger presented the preliminary findings of a study on VET policy instruments contracted by the European Commission in January 2018, and offered four options for ECVET’s further development. The meeting was an opportunity to discuss the pros and cons of each option. Mr Santos stressed that no decision has been taken yet, and that, independently of the chosen option, the ECVET principles and tools are valuable elements, which will continue to support the establishment of flexible learning pathways in both initial and continuing VET, as well as facilitate and value VET mobility experiences. The users group members indicated their willingness to continue to provide insights and strengthen ECVET’s role in Europe.